It was high session in April end.. At 6:30 PM I and my friends Angelika, Kama, Feszta and Srini boarded the bus for Zakopane at the main bus station of Krakow, for a 3 hour drive south. I must admit I haven’t seen much of the scenery along the way, as I was talking to Srini all the way through most of the trip. 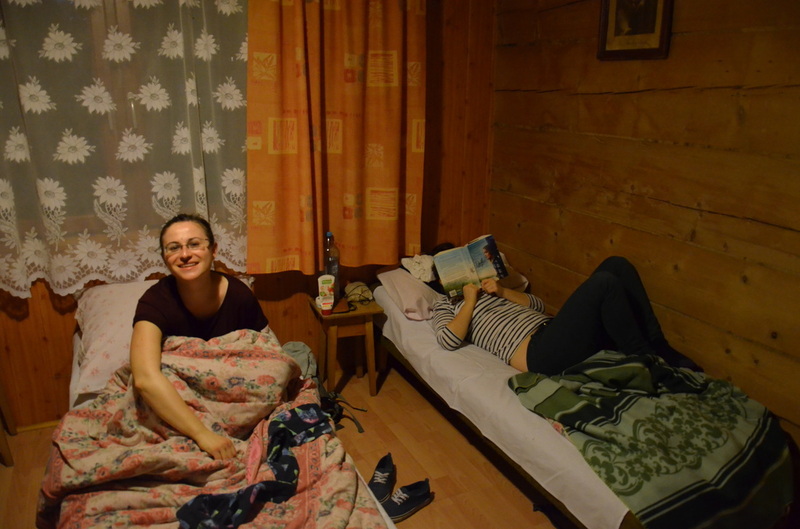 Without any problems we arrive in Zakopane around night 10 p.m. First thing we did was, checking in rooms. The Carpathian Mountains are the second longest mountain chain in Europe (a 1500 km arc, second in length to the Scandinavian Mountains), stretching between the Czech Republic, Slovakia, Poland, Hungary, Ukraine, Romania and Serbia. 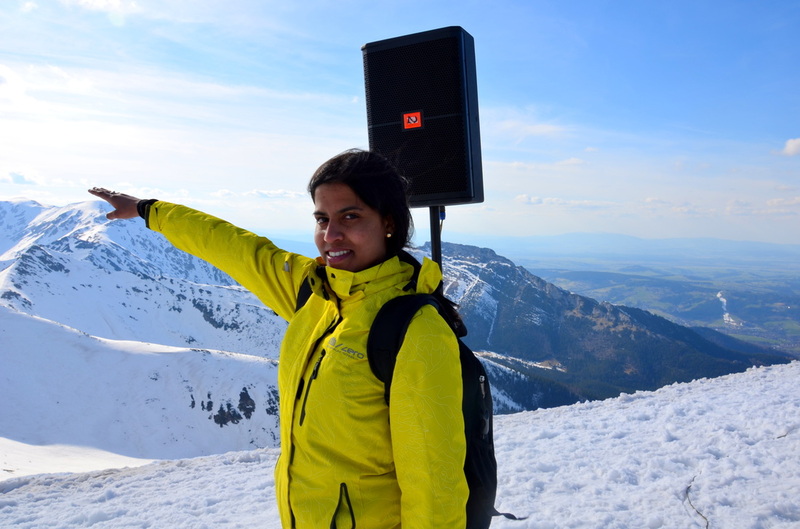 The highest portion of the Carpathians is known as the Tatras – a mountain range that forms a natural border between Poland and Slovakia. 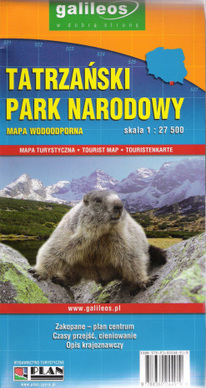 I highly recommend picking up a trail map before you head into Tatra National Park. Hiking without a guide is safe on many of the well-marked and well-maintained trails, but you should plan your route nonetheless. 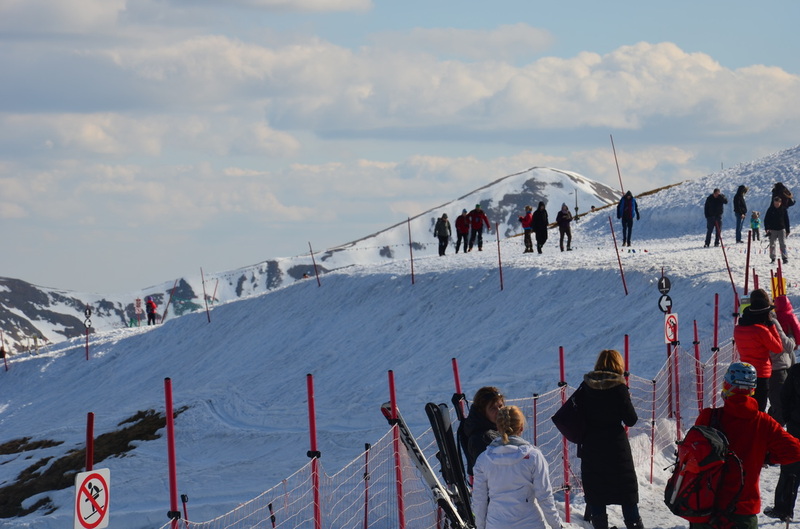 Getting lost or exhausted in the mountains, especially given the fickle nature of the weather and temperature at elevation, can be very dangerous. 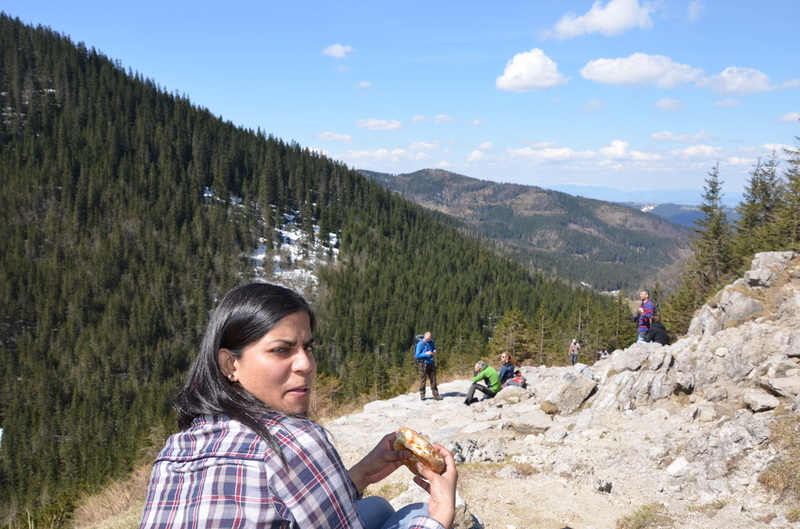 We pack plenty of food and water for hike – we brought sandwiches, chocolates and 3 liters of water each, which proved more than enough for our long day of hiking. To lug all of this, We traded the heavy bag back and forth during the day. 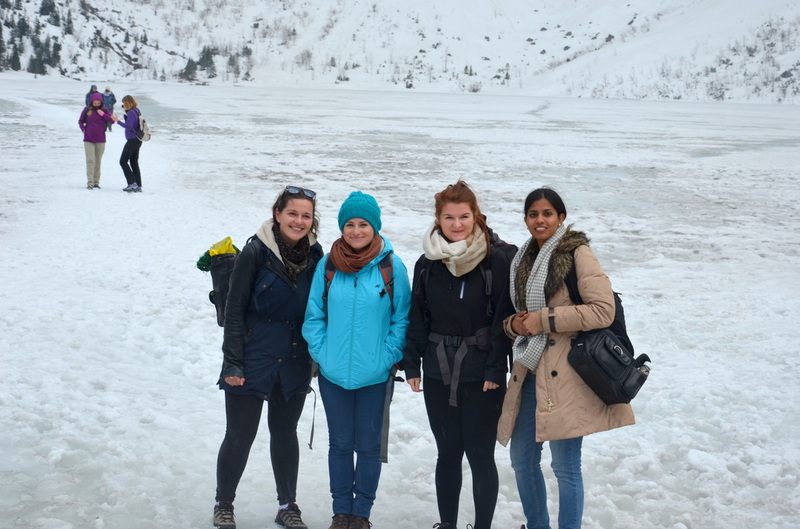 We tucked in early around 9 a.m and organized our backpacks for the actual trek beginning the next morning – leaving our city clothes behind and unpacking our trekking gear. I should note here that when you’re backpacking the thing you need is ALWAYS at the bottom of your pack – no matter how strategically you load and unload each day. It’s really easy to make a mess of your surroundings no matter how organized you try to be. 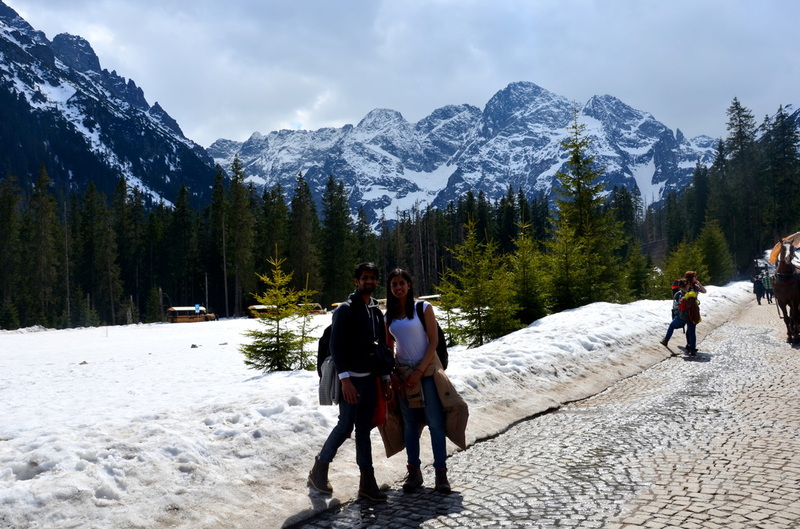 Because there is so much to do here (there are like a thousand routes for walking and climbing) Kama stated goal for our first day of hiking was the Kasprowy Wierch and second day to Morskie Oko. 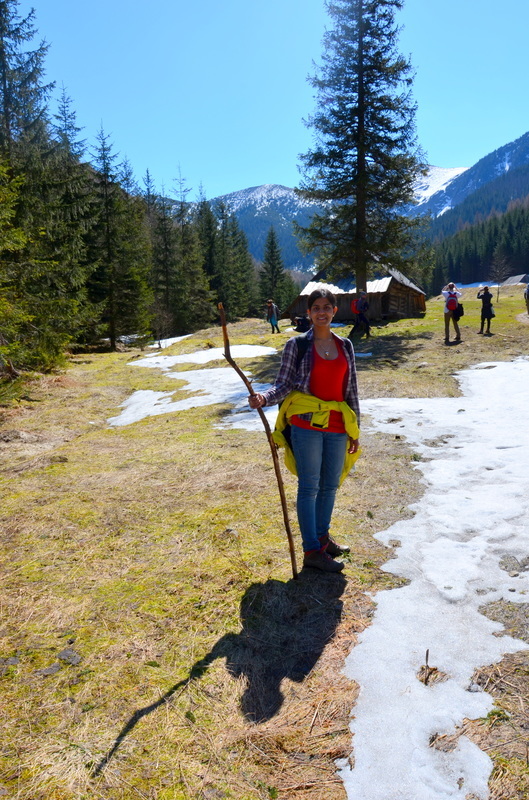 So around afternoon, we followed her and took a mini bus to the Kasprowy Wierch. View of the mountains from the place we started. We arrived here around half past 11 in front of the ticket office. For seasoned adventurers, this is just a long walk with a few scrambles. 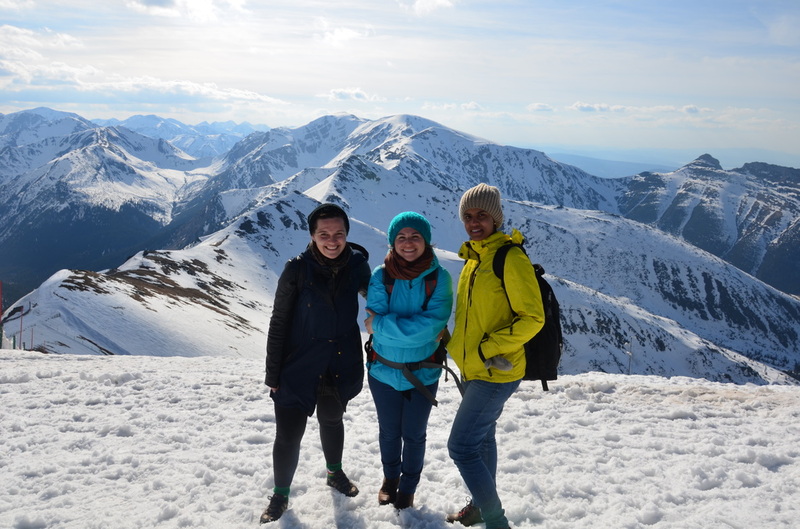 For sea-level dwellers like Kama, Feszta and Angelika, who aren’t in bad shape but don’t spend time at elevation, this would be a greater test of endurance. Personally for me had no experience trekking in the mountains before. So this was a scoop. I was stunned. Our first leg, Kasprowy Wierch. Nice, and worth a visit, real wow factor. It was a forested path that led us up, then down again. Just more elevation to regain on our way up! Things came together on the final 180 minute ascent of Kasprowy Wierch. As if on cue, the sun burned through the clouds and raked the mountains ahead. Tree-choked paths gave way to wide scenic views. The view was just so gorgeous. I still can’t believe it. And I started getting warm in no time. I even took of my jacked at some point. I’m amazed I didn’t caught cold doing so. To kill time while we made our decision, we ate sandwich from our packs. I was starving!!! A moment of quiet and a bit of food somehow gave us the courage to move onward and upward. It was hard to explain. We shrugged, grabbed the rock and tree bark and proceeded. The path up from here was ridiculously pretty and unforgettable. 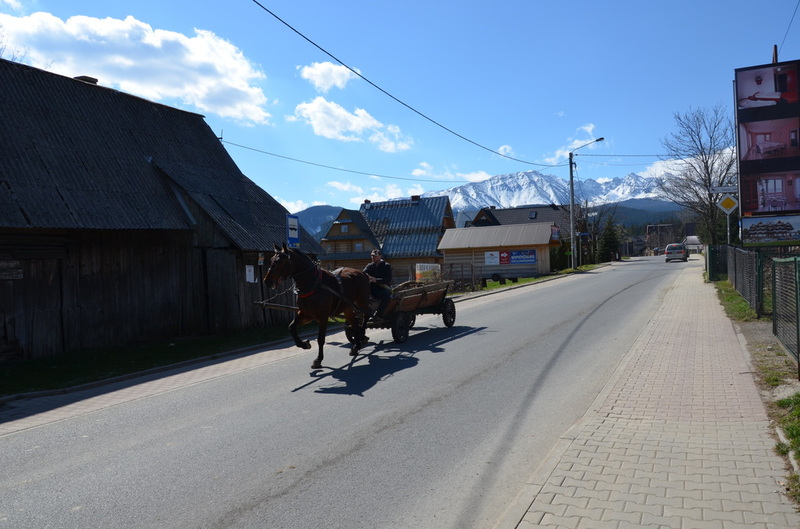 Who knew southern Poland could be this gorgeous (answer: Poles)? 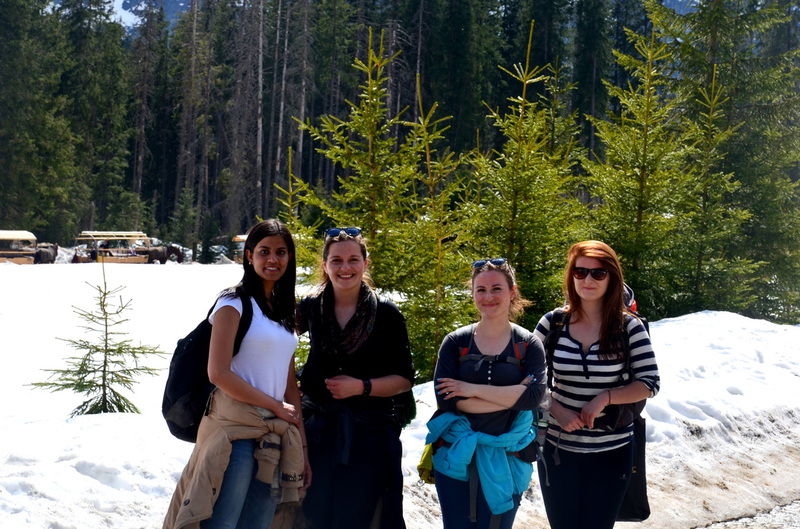 These were the moments that defined our trip to Zakopane, and were among the fondest of our entire trip to Poland. Our hard work was paying off. I felt alive, joyful, free. The final ascent required a little more effort than long hike behind us. Near its peak, it is composed of slippery rocks and snow that require a bit of a scramble. Chains have been embedded along the way to mark the way and provide a fail-safe for conservative climbers. Falls could be particularly nasty here. For rock climbers, this is nothing. For the layperson, it’s a bit scary. In bad weather, it’s not recommended for either camp. 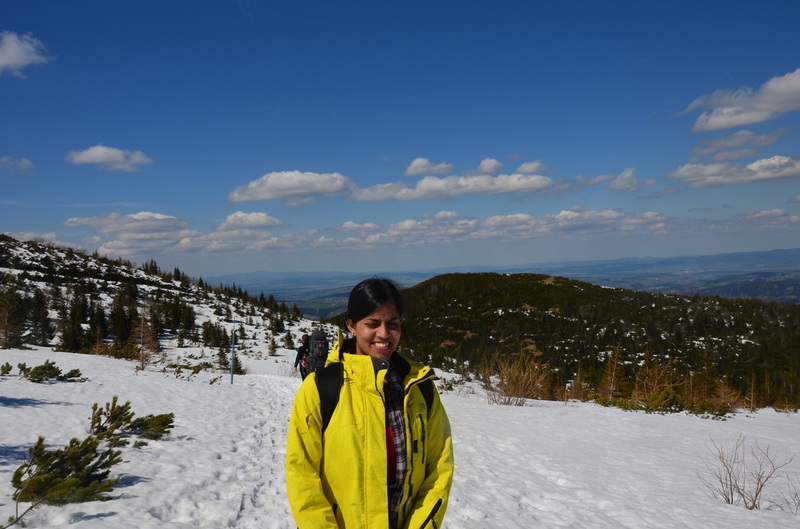 We let a few groups of hikers sidle past us and onto the chains while I negotiated and girls courage for the remaining climb – I weren’t sure if it was something in which i was interested. The summit came faster and easier than anticipated. We enjoyed 360-degree views. I was totally exhausted. My legs started to ache very much. 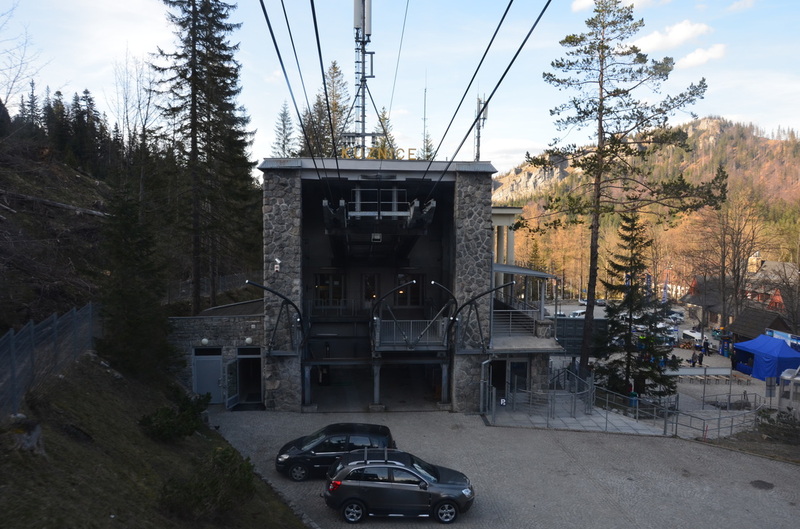 So I was advised to take gondola for another final 45 minutes. Finally I am here in Kasprowy Wierch. A view from top. Waiting for my friends for rest 45 minutes. I had a chance to meet Poland President- Bronisław Komorowski. He was here for presidential election campaign. 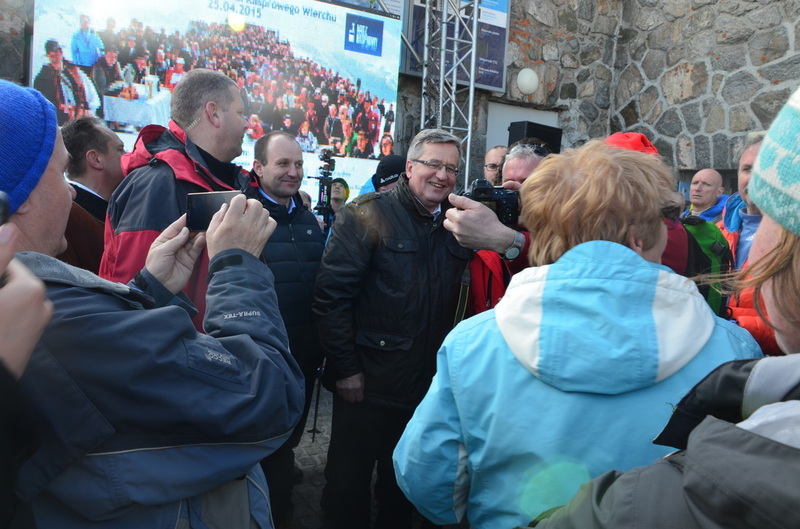 It was political rally in Zakopane. Finally we are in top. The scenery was simply breathtaking. I can with no words describe what I felt. I remember thinking “Wow” constantly. I think I might have actually been saying it out laud over and over again. “Wow!”. 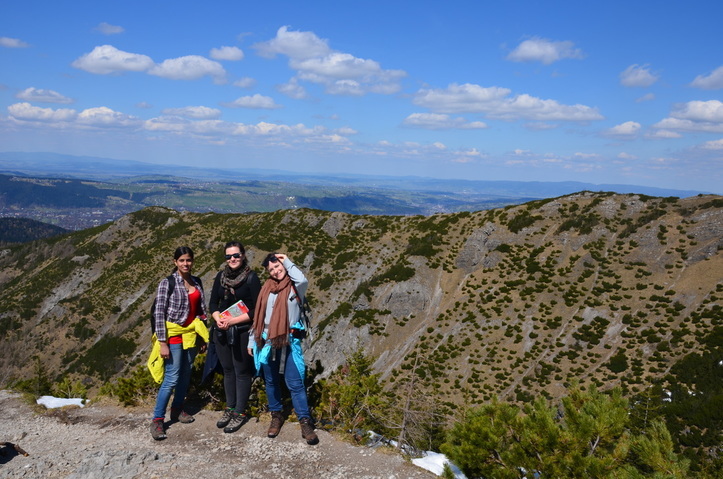 Than I remember thinking “Thank you so much Kama Anja and Feszta for this trip. I am so glad I waited for this! You GIRLS the best”. So thanks again for the trip, you really made my day back there! 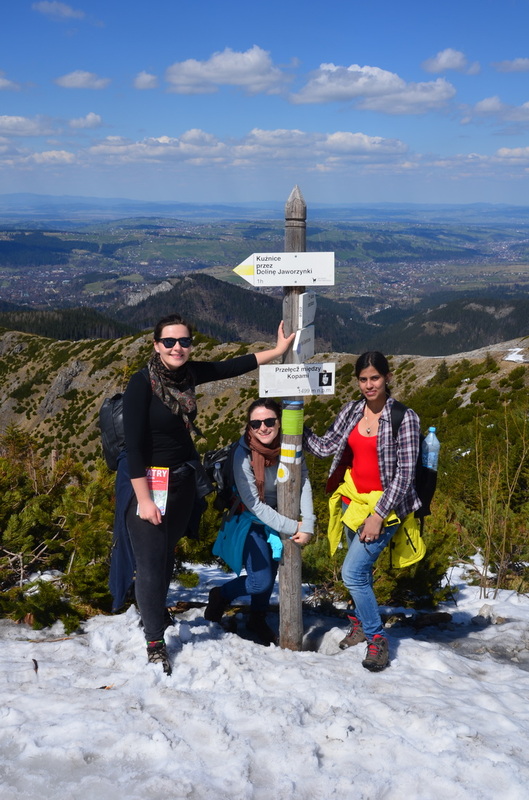 Ten minutes at the top was enough – it was already late-afternoon, and we needed to get moving if we were to return to Zakopane before dark. The descent took us 5 to 6 hours. Fortunately, this path is about as easy as they come – wide and well-groomed, built for afternoon strolls, not rigorous hikes. About 15 minutes got us to the exit of the mountains. Whew………….. 😀 k so you’re probably thinking I never walked all the way down that mountain? 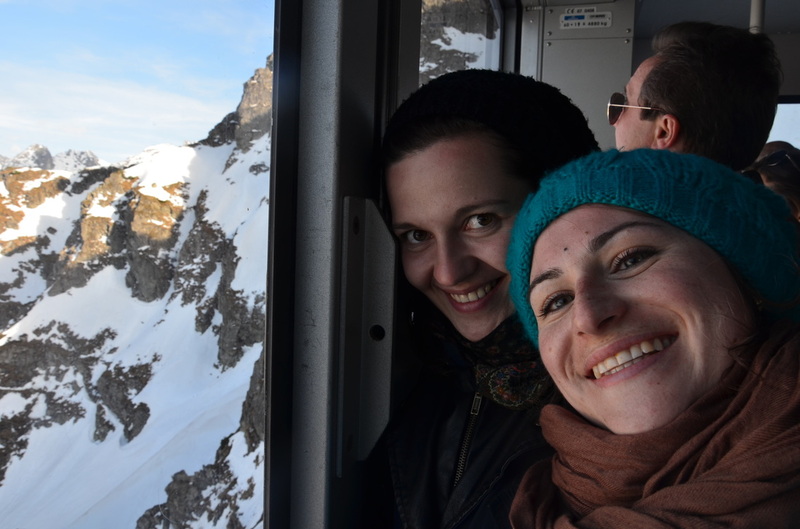 You’re right, we took the cable car instead.However, with the amount of time it took to reach the top, and realizing how high up we were, I was forever grateful for the invention of the cable car! 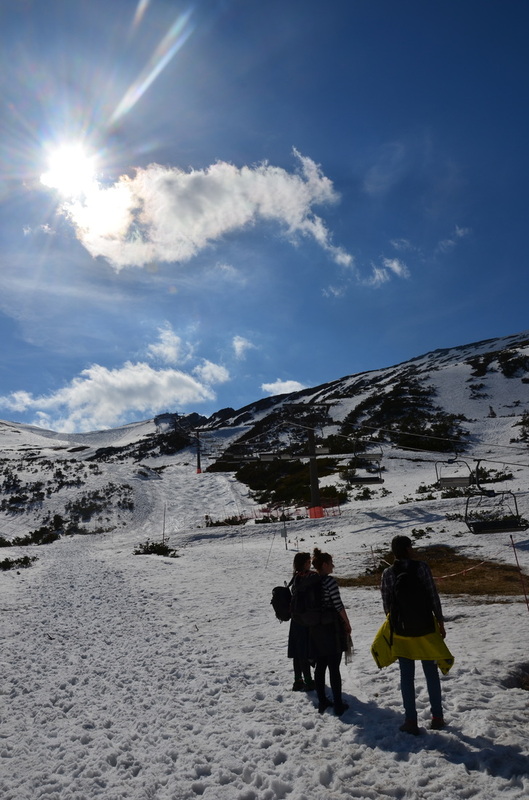 We exited the park and lumbered back to Zakopane on aching legs, groaning the entire time. Our total elapsed hiking time was just under 13 hours including our morning delay because of mini bus. Exhausted. Sleep. A little pride of accomplishment, too – why not? Next day along with Srini, we attacked the mountains again. The weather was okay, the visibility good. But no matter – after all, weather is to be enjoyed or ignored! 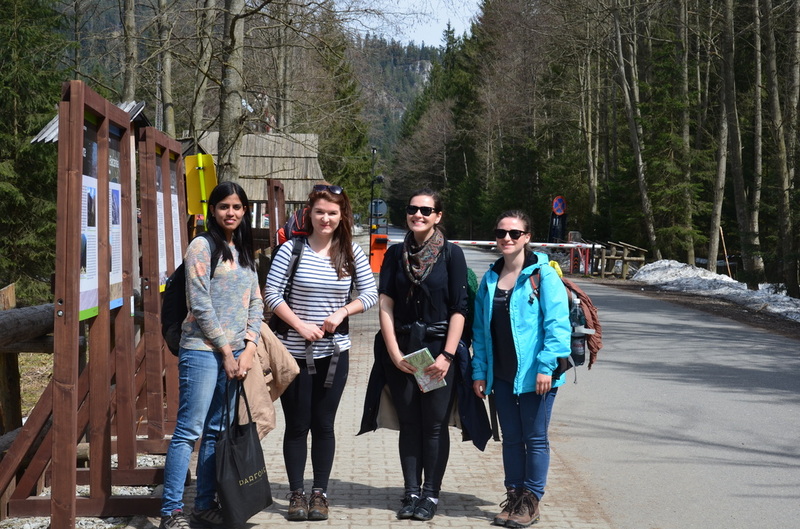 We set off for a big green lake surrounded by mountains: Morskie Oko, “The Eye of the Sea” (elevation 1395m). We woke up at 5.30am, took a taxi to the place called Polana Palenica. From there it is a 4-hour hike up to Lake Morskie Oko. Nothing prepares you for the beauty of this lake. It is the biggest lake in the High Tatras mountains and lies at about 1400 meter above sea level. We DREAMED of having the water very clear and has a beautiful emerald green colour!! but wait till i break the suspense. 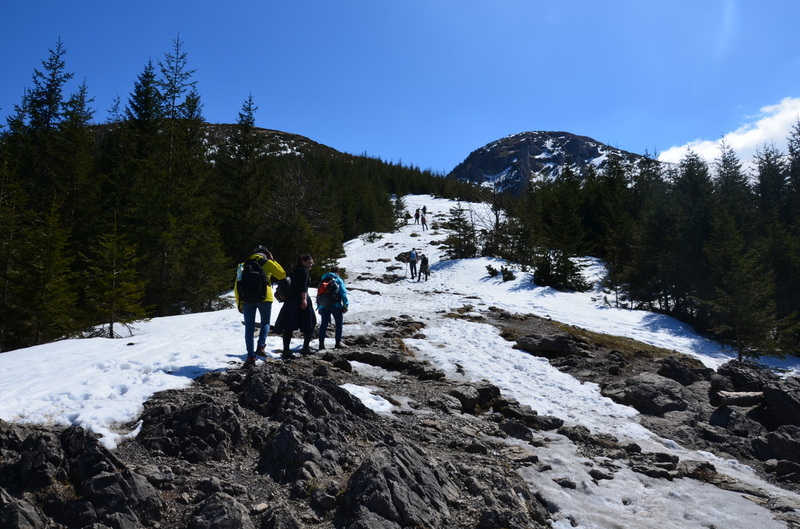 From Polana Palenica it is like 9 km hike up to the lake awaits you (between three and four hours up). 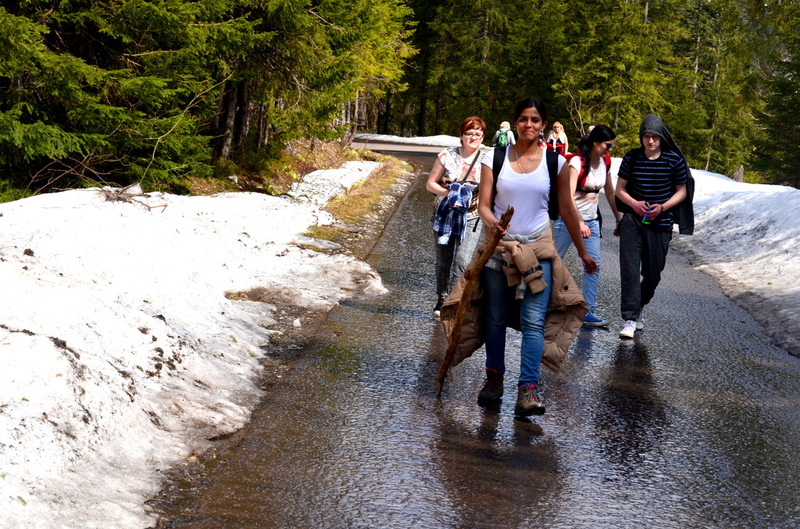 This is not the best hike in the Tatras. No. 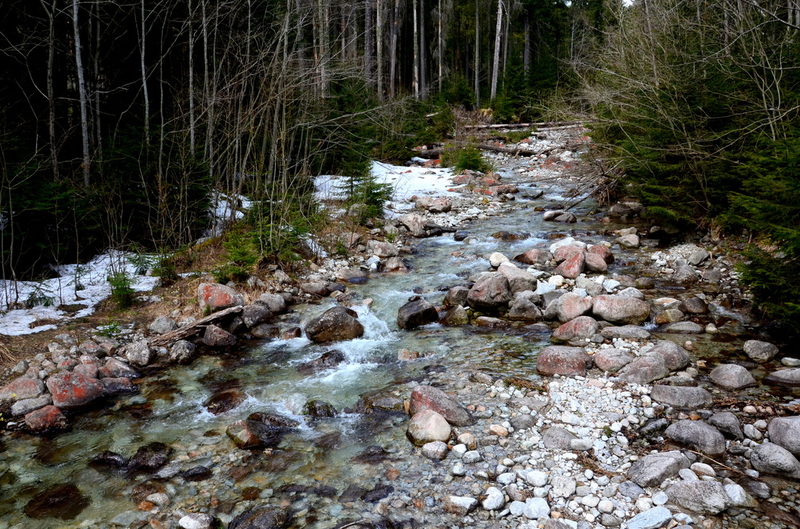 The route to Morskie Oko is largely on a paved road transited by horse-drawn carts and endless supplies of tourists with nordic walking sticks. 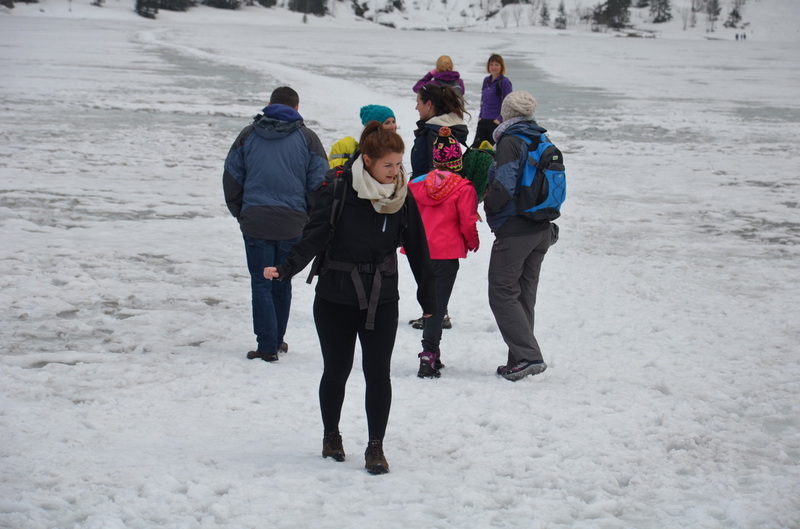 Morskie Oko is a very beautiful place, but it’s not off the beaten path by any measure. Temper your expectations. a creek seen on the way up. After munching a self-made sandwich we started to walk and walk and walk ….. pweeehhh! 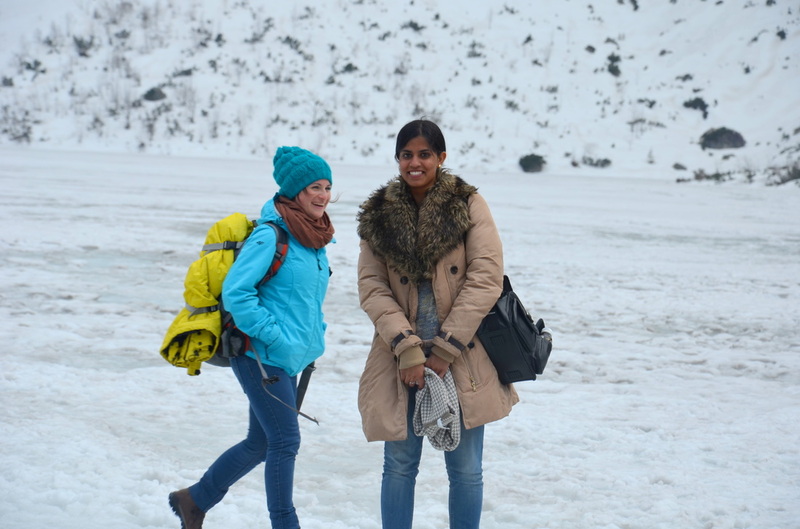 I and Srini having our first trekking. We hoofed it. No cheating! To kill the time, we were talking non-stop! 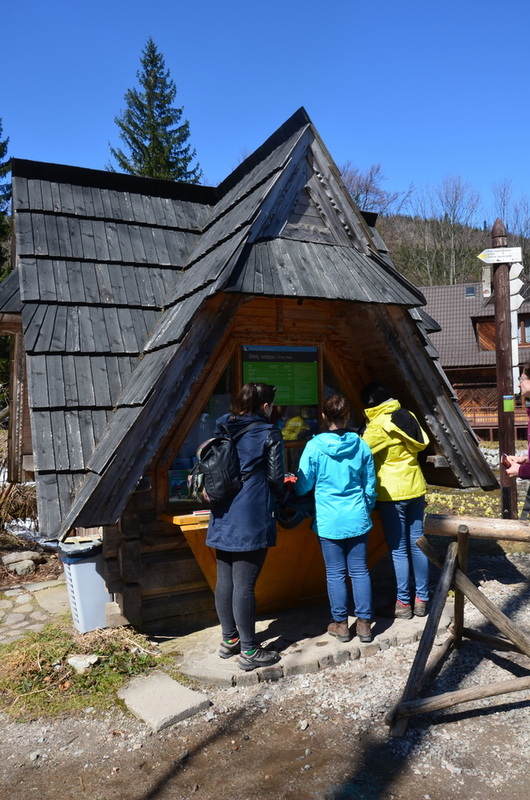 We arrived at Morskie Oko damp and cold and ate our picnic lunch of sandwiches and cookies outside the crowded mountain restaurant overlooking the lake. It was cold. This place was a little too touristy. The suspense: FROZEN lake ! 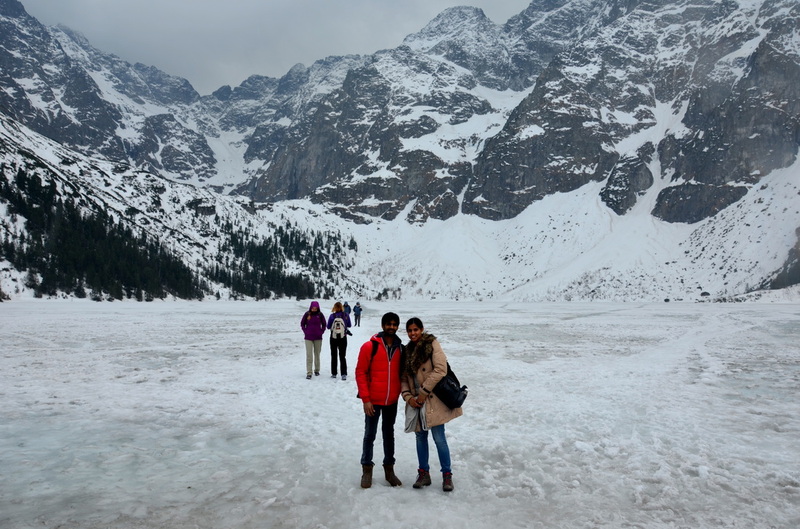 It was nasty weather and never cleared, so we got a look at the lake which was totally FROZEN 😦 , but not much of the surrounding mountains, which include Rysy (2499m), the highest peak in Poland. 01:45 pm. Final Photo. And way back! 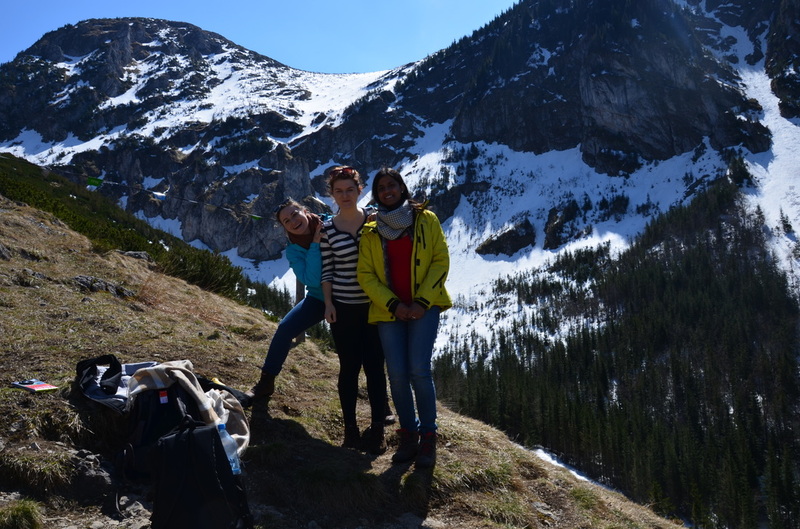 After this we hiked back down and finished circling Morskie Oko. 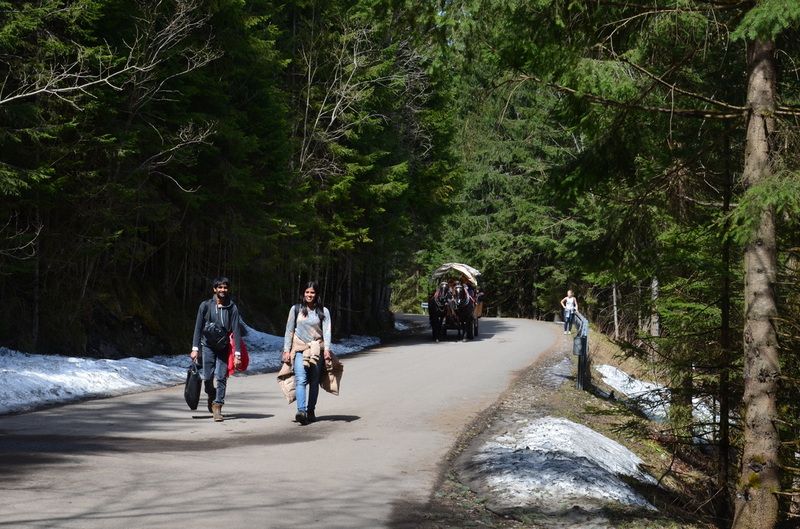 Nine kilometers of hiking downhill got us back to the park entrance and return transit to Zakopane by bus. All in all it was an exhausting 10 hour hike but definitely worth it. 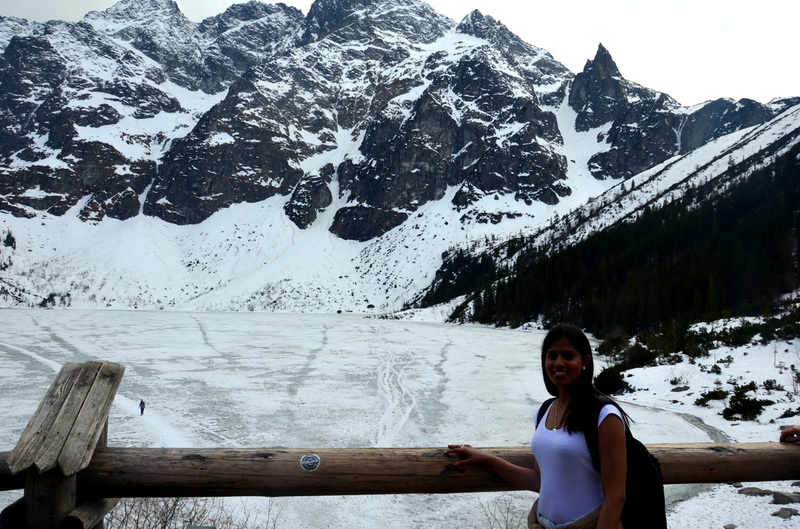 The lake Morskie Oko is one of the most beautiful I´ve ever heard but disappointed about the frozen lake. After this we took a bus to Krakow city. 🙂 And the best thing about hiking is always the part when you get back to your home, when you drop down on the bed and feel absolutely content with what you just achieved and happy with yourself and the world in general. Thank you so much. I will keep updating. I am sure you will make something out. If proper “WORK” doesn’t swallow me whole for September, I’ll soon be putting up some really great stuff on other polish mountains that rings my bell about as much as anything ever has. I think you’ll dig. It means a lot. Really difficult to read every thing but seen few photographs, awesome pics .